There is literally nothing in the genealogical world to compare to an institute: a week-long intensive immersive experience that is exhilarating, exhausting, entertaining and educational — often all at the same time. This is my fourth year at IGHR, which is co-sponsored by the Board for Certification of Genealogists. This year, I’m teaching Copyright for Genealogists in Course 6: Genealogy as a Profession, coordinated by Elissa Scalise Powell, CG, CGL, and presenting three evening lectures on ethics, indirect evidence and DNA. And… wonder of wonders… I’m getting to learn more about researching my family. My mother’s kinfolk traveled all over the American south. The only state south of the Mason-Dixon line where I don’t have ancestors (or at least close collaterals) is Florida. And I am having a ball in Research in the South, a course with varying content each year — and this year it’s Kentucky, Tennessee, Alabama and Mississippi — all states where I have roots. The course is coordinated by J. 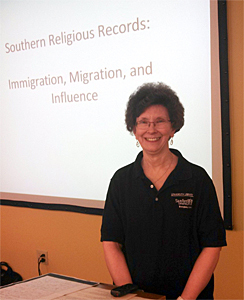 Mark Lowe, CG, who offered some terrific insights into migration patterns in the south, and the instructors yesterday were Deborah Abbott, Ph.D., on Mississippi records, and Elizabeth Crabtree Wells, coordinator of the Special Collection Department of the Samford University Library, on religious records from the South. I wouldn’t dream of depriving you of the joy of learning for yourself the wonders of the institute experience… but I also wouldn’t dream of not sharing two very neat resources I learned about yesterday. The first, from Deborah Abbott, is the J.B. Cain Archives of Mississippi Methodism at the Millsaps College Library in Jackson, Mississippi. If you have a Mississippi circuit-riding preacher in your ancestry the way I do, this is a must-visit location. The records aren’t online, but hey… you wanted an excuse to visit the ancestral homeland, right? This is a good one. From Liz Wells came some absolute gems that had everybody in the class sitting up and taking note. She showed a series of maps, showing the spread of various religions across the United States. They are from an atlas that was new to me and, from the reactions of others, new to most of the class. It was published in 1932, so it’s still under copyright — that means you won’t find it on Google Books. But you can find it online. The University of Michigan has digitized the atlas and in all its glory it’s online at the University of Michigan Digital Library. It’s not all that easy to use — you have to work through the individual pages of the table of contents and/or the index to find the subject matter you want and then open each text page or atlas image (plate) individually. But it’s absolutely worth the effort to see this first class piece of work. Remember: still in copyright so don’t copy the pages and put ’em up on your blog or Ancestry or FamilySearch. This is a research reference only. I can’t wait to see what the rest of the week holds! What a wonderful picture of one of my favorite people. Please tell Liz I said hello! I attended IGHR seven times but have not been back since 2006. I learned so much. Would like to be there right now. I will definitely pass on your regards, Kay! I live a few blocks from Millsaps College and have done research at the J. B. Cain Archives. It’s a great place to search for Methodist roots. Likewise, my alma mater, Mississippi College, in Clinton, MS houses the Mississippi Baptist Historical Commission. Don’t overlook the Mississippi Department of Archives and History in Jackson. I definitely plan to explore the Atlas of the Historical Geography of the United States. Thanks for your informative blog. Where are your Mississippi roots? Hi, Kat! Thanks for the additional information. My Mississippians were from Lowndes, Winston, Neshoba and Rankin Counties, and were in the state from pre-statehood until after the Civil War. Surnames Robertson, Gentry and Killen. A Mississippi circuit-riding preacher! Wow. I have lots of “Reverends” and even missionaries among my ancestors. The spread of religions across the South in particular has always fascinated me. I come from the upper to middle South: Virginia, North Carolina, South Carolina, and Georgia.